12 Days of Holiday Giving – Day 8! It’s Day 8 of our “12 Days of Holiday Giving” and the holiday inspiration continues! 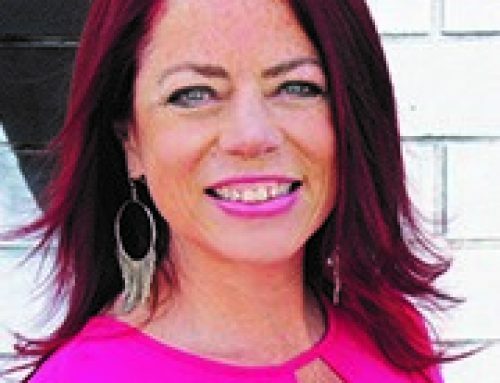 Joining us today is our fabulous Art Director Cathy Zielske (who always makes us look so good!) to share some graphic, beautiful tags with you. We’re also excited to have our friends from Photo Play Paper and Your Next Stamp here and maybe, just maybe, there will be a little bonus at the end too 😉 Let’s get the Day 8 party started! “One of the things I love to do during the holidays is creating my own gift tags for my packages. I love to get a little crafty but mostly I like to develop one look or feel and apply that all of my tags. This year? I’m going with the gray card stock, white embossing powder, and red look. The cool thing about going with a theme is that you get all of your supplies out, mix and match your stamp sets, but keep the feel of everything similar. One of the things that makes it much easier is to have some sort of a tag die set and my favorite is my Tag Infinity dies from Hero Arts. I can quickly punch a bunch of tags and then get to stamping and embossing. I’m using a card stock from Simon Says Stamp called Smoke and it’s just the right shade of gray that allows the white embossing to really pop. On the first tag I used the Lots of Snowflakes set from Simon Says Stamp, and stamped them off the edge of my tag to create a bleed effect. The next tag features the Merry Christmas Script stamp from Hero Arts, and the one next to that is my favorite of this season, the Poster Christmas Carols stamp, also from Hero Arts. The fourth tag features a simple, all-purpose Diagonal Stripe stamp from Stampin’ Up. One of the tricks to getting a good stamped impression on anything is to make sure you remove the static from your card stock first. I use a simple Embossing Magic Bag but you can also use a power tool as well. This ensures that your powder sticks only to the sticky embossing ink and not the paper. I also recently discovered the Sharpie Paint Pen and it works beautifully on this card stock. To finish off my tags I added reinforcement circles, punched out of Neenah Desert Storm card stock using my tag die set, and added some red and white twine from Doodlebug Design. Here’s to the fun of breaking out your craft supplies and creating beautiful, coordinated tags to festoon your holiday gifts! To see a complete breakdown of the supplies I used to visit my blog. Thank you Cathy! The simplicity is stunning as always! Happy Holidays to all our fabulous friends at SCT! We are excited to give away a $50 gift certificate today to one lucky reader. Thank you for an amazing year. Everyone at Your Next Stamp is excited to bring you fabulous new products and lots of fun in 2018! Thank you to our friends at Your Next Stamp and Photo Play Paper for these amazing prizes! We also have one more…from us! “SCT’s 365 Online Class was so popular in 2017 that we’re bringing it back for 2018, too! Another year is coming to an end and you’ve probably amassed quite a collection of memories and photos. SCT 365 is the perfect class to help you get those moments off your computer (or out of a shoebox) and onto pages in your family album, one month at a time! 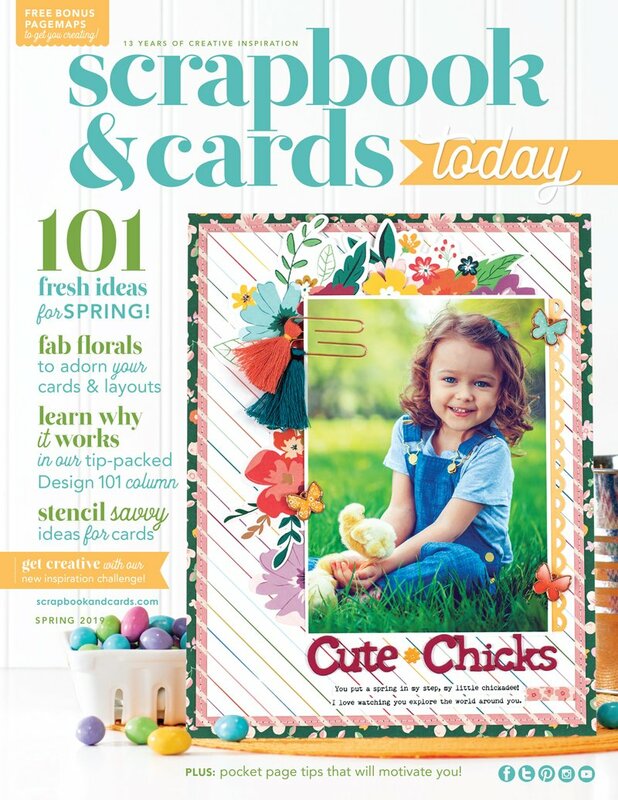 This double-page, sketch-based class features exclusive PageMaps sketches, trendy techniques (all spelled out in photos), a monthly bonus card, cutting files, complete instructions and so much more. On the 1st of each month, the new content will be available to you in the online classroom on the SCT website. Best of all, the content is available to you all year long so YOU can set the pace for this class. This class starts on January 2, 2018.” For more information on this class, and to register, click HERE. For an opportunity to win these amazing giveaways, leave a comment below by midnight on December 22nd EST. All winners will be announced on December 23rd at noon EST. Good luck friends!!! We would also ask that you take a moment to visit today’s sponsors on their Facebook pages to thank them for their generous prizes. Our SCT readers are always so wonderful at saying “thank you” and it’s because of that appreciation our partners love to share with you here throughout the year! Let’s show them how much we are loving these 12 Days of giveaways! If you don’t already “like” them, you may just want to! Have a wonderful weekend friends, we are so glad you joined us today! Have you heard about our brand new SCT Sampler? A fun sample sized array of product delivered to your door each month! Happy mail every single month! We have so many wonderful industry partners and want you to discover your new favourite product. 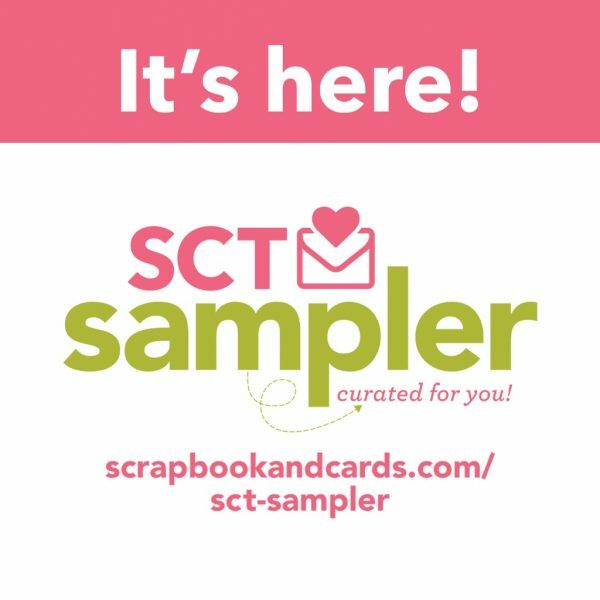 Sign up now to receive our February SCT Sampler as supplies are limited! The tags are so beautiful! Thanks for sharing the idea and all the goodies. Love, love, love those Photoplay papers!! Inspiring me to keep crafting! Thank you for sharing the wonderful gift tag ideas, and hosting the giveaways – very generous and so fun! Cool stamps! Love the white on grey! Photo Play is one of my favorite manufacturers. Would love to win a pack from them! These gift tags are beautiful, a gift themselves. Wow a gift card to chose what we want, fabulous and I am in love with all the papers from Memory Lane and Vintage Girl. stunning. Wow stickers, dies and stamps this is an awesome and very generous prize. Thank you for this chance to win. Gorgeous tags! I never thought I’d want a tag die…now I need one! 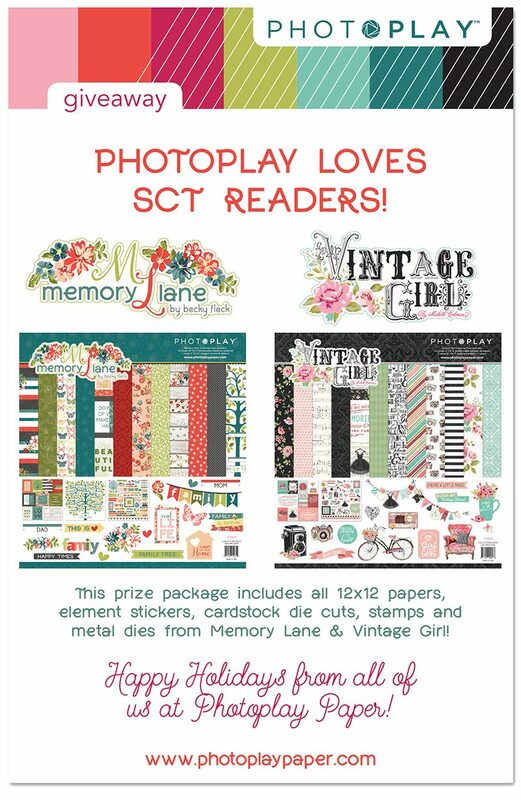 Thanks SCT, Your Next Stamp and Photo Play Paper for these amazing prizes! The tags are just beautiful! Love the use of the Sharpie paint pen on cardstock. The tags have given me some ideas – again such great prizes. So much fun with these daily prizes. Thanks for a chance to win. I think I have the exact same tag die tag die set! Great CAS tag design! Such awesome inspiration and products! Can’t wait to get started on my project! Love your creative motivation! Thanks for sharing your creativity and for the chance to win a prize!!! Happy holidays to all my creative friends ! The tag die set is really neat. Thank you for the inspiration and the chance to win these awesome prizes. Love the grey, white, red combo for the tags! Make enough of them and you have a great set for gifts for each of your scrap girls! The chance to win prizes for the neat how to is wonderful! I love Christmas! Lovely tags. This year I was able to deliver all my presents in person by taking them in my suitcase to a family baby shower in early December. But that meant using gift bags I could assemble at the destination (so TSA could inspect my luggage). So I put all my wrapping effort into making truly special tags. These are lovely designs to add to the repertoire for next year. These tags are beautiful, so clean and simple, just my kind!!! Those tags are beautiful! Simple, but elegant. Beautiful, classy tag are one of my favourite things to create at this time of year. These are so nice! Thank you for another great day of giveaways! i love making my own tags too. i think is makes the gifts so much more personalized. thanks for the chance to win. Gorgeous tags and beautiful papers! I’m so happy to see a project from Cathy Z. I love all her new videos and the fun she has with her cards. After all, isn’t that what it’s supposed to be, FUN! Thanks to all your great sponsors too. Without them, our crafting desks would be bare. I LOVE the tags! So simple but so elegant. I just might have to “borrow” this idea for next year. Thanks you for the chance to win some beautiful things. I love the grey and white! The tags are stunning and so non traditional. They look so classy! Thanks also for the chance to win some great stuff! You guys are always an inspiration! Such beautiful tags! I love the combination of grey ave white. Fabulous prizes too! Love the clean and simple designs on the tags! There are some interesting winsperations! I love tags and I love snowflakes and I love gray so this post seems like it was made just for me!! Thanks so much for sharing and thank you for the opportunity to win-have a wonderful day!!!? I love the grey for your tags. So slick. Wow – these are stunning! Love the grey. I will have to try this! Thank you for another wonderful day of goodies! I left some love on facebook. ThaNk you for the opportunity!! I’m so inspired. These tags are wonderful & give a unique look. I love to make my own tags too. Thanks Cathy Z. And just when you think it can’t get any better, there are even more fantastic giveaways today! Thanks SCT, Photoplay and Your Next Stamp. I just love the tags Cathy made. Simple yet elegant. I’m heading off to see if I can make some of my own…. Love the tag ideas. Yet more wonderful prizes :). Oooh those tags are so beautiful and elegant. I just love gray and white. Perfect for the holidays, too. More great products from great companies! Love them all! I love the beautiful tags! What a wonderful prize pack,! I love these tags! That grey and white with a pop of red is stunning! Thanks for the inspiration Cathy! And thank you all for another wonderful day of sponsors and prizes! Thanks for the opportunity to win such fab prizes ???? Simple and elegant tags! Love the paper collections! Cathy has always been inspiring! Thanks for the chance to win this beautiful prize package. I love your tags! They are so beautiful 🙂 I will definitely have to try this out! I am just getting into die cutting thanks to one of my awesome crafty friends. Love the ideas!! Happy Weekend! Love these tags! Another great chance to win something amazing! Lovely tags, thanks for the idea. Thank you for the tag ideas and opportunity to win such great prizes. Happy Holidays! Thank you for great ideas AND great giveaways! Love the tags! Great giveaway. Thank you so much for this opportunity. Beautifully elegant tags. Thank you for the stamping tips! These tags are so clean and eye catching. Beautifully simple! What beautiful colors in the memory lane papers. The tags look so elegant. I love the tags. They just pop! I love the tags and papers. thanks so much for the chance to win. I am going to like them on facebook now. the tags will look spectacular on the gifts. Merry Christmas!!! Thank you to Your Next Stamp and Photoplay for the fabulous prizes! I love your crafting products! Thank you also to Scrapbook & Cards for organizing this event and offering a prize today. Love the simple design of the tags .. they are beautiful! And such great prizes again today … thanks for the opportunity to win! I love the tags! I will have to give this a try! Thanks again for the chance to win een more great prizes! The snowflake tags really pop! Great prizes from Your Next Stamp, Photo Play and SCT! Seriously am loving the tags! I would love to win all of todays prizes!!!! SCT is awesome!!!! So many wonderful prizes! Thanks SCT and sponsors! Love the beautiful simplicity of these tags! Wonderful color of these tags! I would love to own a tag die set. Love the simple yet great look of these tags. Wonderful prizes today from great sponsors. Thank you for a chance to win. Happy Holidays! What a great tag idea! Thanks for the chance to win such a generous giveaway. Neat idea to do a colour theme on your tags!! Great inspiration and thanks to today’s sponsors! Pretty tags and another great giveaway! Lucky 8–super generous and fabulous prizes today. Thanks so much! Great tags too. Oh my gosh, what a prize today! Younkeep outdoing yourselves, SCT! Those tags are beautiful. Understated and elegant in their simplicity. The tags are beautiful and amazing! The paper is so exciting for the holidays! Thank you! Another great set of prizes. Merry Christmas. Very classy looking tags and great prizes. Wonderful tags, love the classic look! Thanks for the chance to win! Tags are wonderful! I like the crisp white on the paper. Thanks for the tips! Those tags are elegant in their simplicity! So pretty. Thank you so much! What an amazing prize package! I am in love with all of the Photoplay collections! I own a few already, but would love to win these new ones for sure! The next class for 2018 taught by team members of Scrapbook and Cards today, sounds wonderful and would get me motivated to use up my stash!! Would be a happy gal to win any of these wonderful prizes!! Thanks again for the fun opportunities to win! Love the Memory Lane collection. Photo Play your collections are fantastic. Thanks for the chance to win. SCT you are great! Cathy’s style is so inspiring and I wish I could design more like her! Thank you so very much to Your Next Stamp, Photo Pmay ?, and SCT for the awesome prize package today! Such generosity is deeply appreciated! So close to Christmas’s. Love the vibe ! Thank you for sharing all these wonderful ideas. Love the photoplay collections! Good luck everyone! These tags are classy, beautiful and simple! Great give away! Those tags are really lovely! I loved the patter of the ❄️, very original. Thanks for the chance to win!!! Love, love those tags! They are so beautiful! I love the simplicity of the tags–clean and crisp. Thank you for the chance to win another great prize pack! Love you, Your Next Stamp, Photo Play and SCT! More amazing prizes from more amazing sponsors! Merry Christmas! I struggle with the thought of taking time to make tags for the gifts I will wrap because of how crazy things get for me in December, but these are beautiful. Maybe I could make a set for a friend for her to use, though. It’s good inspiration to think about, regardless. Thank you for showing us your work, and thank you to SCT and its partners for this wonderful giveaway. Memory Lane would be perfect for my large heritage project, and I love the images in Vintage Girl! (Also, who wouldn’t want $50?!) Thanks for the beautiful projects you showcase for inspiration. Its so lovely to see how the papers etc all tone and match together. Less wastage and achieves greay results. The tags for gifts etc are very classy. These are great ideas for tags. I like the use of the white and silver (or grey) look because it’s not too Christmasy, but still very festive and classic! I love how the colours for the holidays this year seem to be more towards the soft and gentle neutrals. The grey splashed with white and accented with the red are so pretty. Great tags. Love the gray and white look! Lovely tags! Love the white on grey! Love these tags – sometimes less is more! Grey, white, and red looks lovely – in fact, my living room is white, black, and red, but I don’t think black tags would be appropriate for Christmas! Prizes once again are fantastic! Gray, white, red–fabulous color combo & tags! Love the prizes today & if I win the class my friend Helen would be the person I’d want to also win as she’s a fabulous scrapper! Such lovely tags and an awesome giveaway! I’m in love with making snowflakes but I’m so bad at it! Definitely need a stamp! ? I SO love the Vintage Girl papers and believe they would make great tags also. The grey and white look amazing together. I have never even thought of using those colors together for Christmas. How elegant and beautiful! So pretty. What great tags. They are very elegant. I love the white embossing on the gray cards. It really pops. Thanks for the opportunity to win one of the wonderful prizes for today.. Such cute tags! What a wonderful prize pack! Thanks for the opportunity! 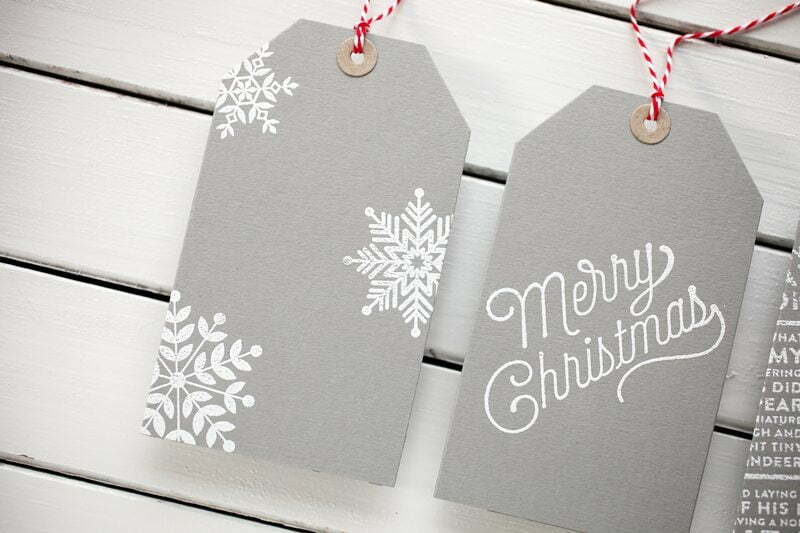 These tags are elegant and simple – perfect for my gift giving. Great tags, great paper, too. Love the designs and the giveaway. These tags are lovely. I would love to make tags and put the new in the holiday fair for our school. It would be a delight to win any of the above prizes especially the SCT 365 onlineclass. Thank you Photoplay, Your Next Stamp and of course Scrapbook and cards for the great prizes. white pop and is a unintrusive background. OMG! Wonderful a day on the SCT blog! Great projects, and very generous prizes, each worthy of a single prize day on their own! Someone will be very lucky to win today! Love these tags! Thanks so much! Love the simplicity of these tags. They are gorgeous! 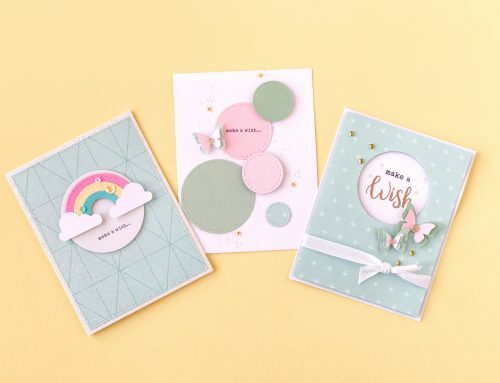 Love the color combinations of both collections, Memory Lane and Vintage Girl and would love to create in the New Year with both of these. Love the tags!! Thanks for a chance, Merry Christmas! Beautiful tags! Thanks for the great giveaway too! Love the tags! TFS loving the gray paper on white…wat a great simple but elegant idea! Thanks again for a great generous giveaway…love these products especially SCT! Thanks for the chance to win one of theses great amazing giveaways! I love Photplay paper and I’m always up to learning about new companies! Another day of great inspiration and amazing giveaways!! Thanks to all of your sponsors for sharing!! What a great lineup of prizes to be won! Gorgeous tags and amazing giveaway. Tags are gorgeous! Love the grey and bites and delicate stamp sets! Thanks for the chance to win such wonderful prizes! Oh! What fun these would be! Those tags are AMAZING!!! I didn’t know about the die set. Definitely want that!!! I really love how you used stamps from different companies. Thanks for the chance to win such wonderful prizes. These tags are lovely! Love that smoke cardstock!! Awesome prizes today. I really like Your Next Stamp. Their stamps are super duper cute!! Thanks for the chance!! Love the tags! What amazing giveaways today!! Thank you SCT!! Lovely monochromatic colour palette on these tags. It is truly elegant. Thanks to the sponsors for today. Would make good use of this! I love the tags. Simple but so cute! Another day of wonderful prizes. Thanks so much for the chance and all the great sponsor participation! THANK YOU Your Next Stamp, Photo Play Paper and SCT!!!!!! I love these tags, it’s the simplicity that makes them just beautiful! Love the tags and simplicity of the design. Will definitely try for next year since my area is completely sold out of white embossing powder and I ran out! Thanks YNS, Photo Play and SCT for great prizes. WONDERFUL tags, so ELEGANT and a touch of LUXURY with the white embossing! THANK YOU for the chance to win a very HAPPY & CREATIVE New Year! The tags are so classy and pretty! I love the ideas you share on this blog so much. Thank you for the chance to win the awesome goodies! Great prize! Thank you for the chance to win! 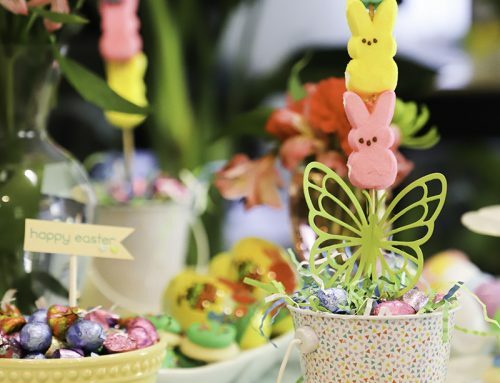 I’ve always loved Cathy’s creations…plus, she’s a hoot. Hope her hand continues its healing! Great prizes. 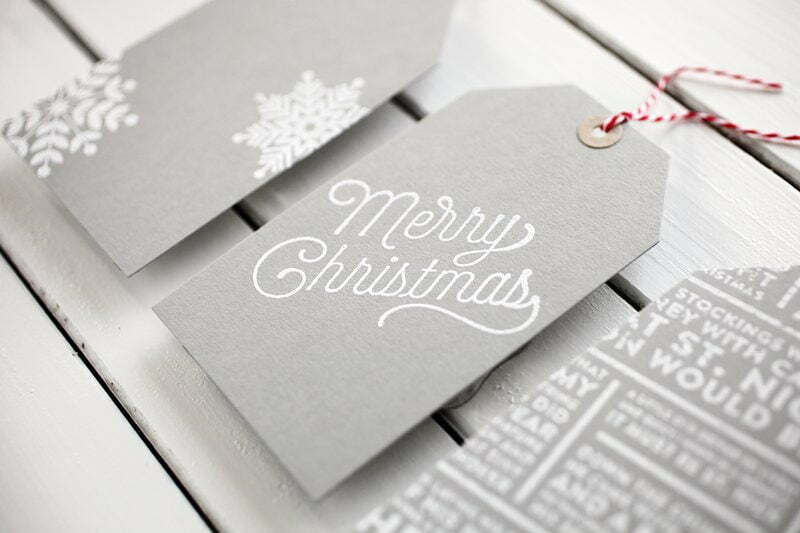 I would never have thought to use grey for holiday tags, but they look beautiful and festive! Thank you for sharing ways to use untraditional colors for our holiday crafts. Love the stunning simplicity of the tags. I’ve never thought of embossing white on grey. Fantastic prizes today – thank you! Both of those paper kits are on my Wishlist already. Those tags are elegantly simple and I love the little bit of red with them. I would love to win the great prizes in this giveaway! I like the clean and simple look of the tags and the colour combo is very classy! I have never thought of making gift tags, but “I have seen the light”. I am going to design tags for all occasions and using this great giveaway will enable to me to make custom tags for each individual. Thank you for offering this giveaway. Wow! That’s a great prize! Thanks for the chance of participating! The papers are beautiful! The tags, oh my! Great ideas and inspiration for my next pages! Absolutely gorgeous tags! Thanks for the ideas and inspiration! Those tags are lush – I love the gray & white. They’re so eloquent! So elegant and would be beautiful on any package. Love the tags and reading your discussion on making Christmas tags! The technique looks so very sharp! Thanks for sharing with us. And many thanks to the vendors for sharing such awesome prizes with us! Such cute tags and a wonderful gift to give away! Thanks. Love the CAS tags. Placement on the tags is wonderful. Beautiful tags – I love Cathy’s clean and simple design approach. It’s so effective and classic. I love Cathy’s style. Everything she creates is so simple and so elegant! I have really enjoyed following her cardmaking journey this year. 🙂 As for today’s prizes…wow…can’t say enough good things about them. All wonderful and so generous! Thank you SCT and sponsors. These white-on-gray cards look fab! Thanks, Cathy Z! Thanks also, SCT, for the chance to win! I’ve only recently discovered Photoplay and have loved their collections! Your Next Stamo is also new to me. I have tried a couple of their products and would love to try more. Thank you! Love the tags! Thank you for the opportunity to win one of these great gifts! Wow – awesome prizes again! I love those tags! The white stamping on that soft, dove gray – super simple, and elegant. I am stealing that idea! Now these tags are more my speed, simple yet elegant. Thanks for sharing! Wonderful tags! Thanks for the opportunity to win these great prizes. The tags are lovely and the giveaways continue to be amazing!!! Love those tags I have to check out that white sharpie marker as my gel pen always seems to leave scratch marks. Love the give away prizes.. So beautiful and very generous. Love those tags. My favorite was the one with the snowflakes. Great companies offering great prizes in the giveaway again today. Thank you! I have been making tags this holiday season and love these ideas! Thanks for the inspiration and another day of amazing prizes! Always love Cathy’s designs. I have been trying to make my own tags. It started with tags for Santa to put on the gifts he brought and then I made them for my own packages. This year, my oldest daughter helped me make a variety of tags. The tags are so pretty and give me inspiration to make some. Thanks for giving us a chance to win some cool products! Great tags! Love this die set! Thank you so much amazing sponsors! The tags are such a practical project, thanks for sharing. Great prizes today, love the Photo Play papers! Beautiful tags, great prizes. So exited ? What a creative idea! Loving the colour combinations! These tags are lovely! It just shows that simplicity can really be beautiful. I just love this idea! These tags are lovely! It just shows that simplicity can really be beautiful. I just love this idea! Thanks for the fun giveaways! Love the photo play papers, and love the clean tags! Great tips! I have just discovered Photo Play paper, and I am in love! Fun, Fun, Fun! I love the grey, white and red color combo. Classic! Love the tags and love the photoplay paper. Great tags…Love the idea of cutting your own. Great gift package! Love the gray and white tags. They have a royal look to them. Love my sharpie white pen also. 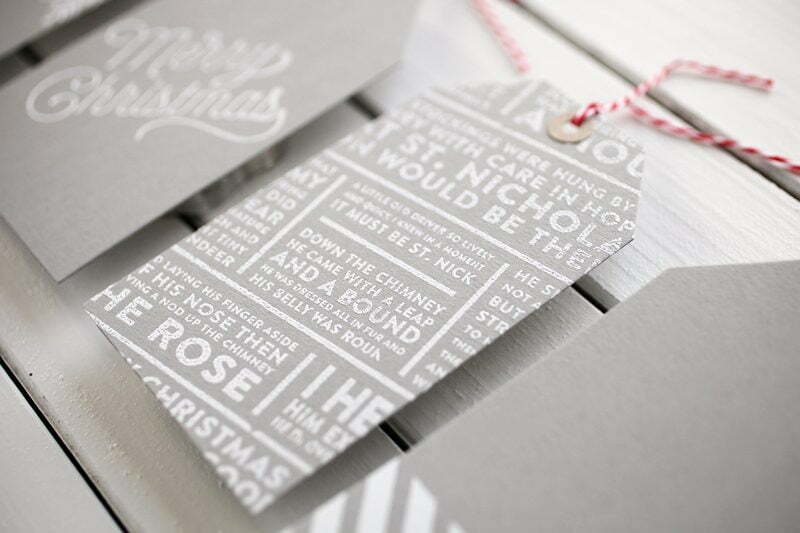 The Classically elegant gift tags are so beautiful. They make me wish my gift had that tag! Love those tags! Never would have thought of grey as a Christmas color but they are beautiful! Thanks for another day of inspiration!! Wonderful prize packages from Photo Play, Your Next Stamp and SCT has done it again! Thanks for the chance to win! i not only need that tag die, but the circle ‘reinforcer’ punch’ from the previous day. am loving all these incredible ideas and can’t wait to get started playing again. Love photo play paper packs! I love this tag, love the simplicity, but yet so beautiful! Thank you for offering such great giveaways! Merry Christmas everyone! Those are totally amazing prizes! Thank you to the sponsors. Cathy’s tags are very classy looking but simple to make. Great idea! Seeing these beautiful tags is making me wish for a die set !! Beautiful gift tags! I look forward to being able to spend the time doing this next year! I love the white on gray! I may have just found my color theme for next Christmas. Thanks to all for these great giveaways! More gift tags! Love that card stock. I’m entering to win quick and then heading off to find that Card stock. Thanks sponsors! Love the tags! Thanks for the creativity! These tags are so very elegant! I love how simple but elegant the tags are. And how using the same two colors you can mix and match various stamp sets. I will definitely visit their FB pages. Thanks for the chance to win and awesome group of items. Really love the grey, so sophisticated looking. Great ideas! Super cute tags!! Thank you for the giveaway! Loving these gray and white tags! Awesome trio of prizes today! Yummy and yay! TFS! So many wonderful prizes; thanks for the chance to win! Thank you for the chance to win 12 Days of Christmas SCT! The embossed white snowflakes look so elegant on the grey tags! I love how the white embossing powder pops on the grey cardstock. Lovely tags! Thanks for the chance to win! I love the gray theme for these tags. I definitely want to try this! What elegant tags! Love them! The prizes are once again fabulous. Love the Vintage Girl paper and would be extremely grateful to win the class for myself and a friend! Those tags are gorgeous and so easy to a make – thanks for sharing. Fabulous prizes! Love the grey colours! Love the tags and love the photoplay paper. Embossed white snowflakes are my favorite at this time of the year! Thanks for a chance to win in the “12 Days of Holiday Giving”. Merry Christmas everyone! The paper kits are beautiful and the chance for inspiration for a whole year is awesome! Beautiful tags but now I’m feeling guilty for not making my own this year! ? next year! Love the tags and now I’m definitely going to be looking for that Sharpie! Gorgeous tags! So simple, yet elegant. The tags are so elegant looking & easy! Thanks for that! Love the tags – the simplicity makes them beautiful. Smashing prizes – thank you! So much inspiration in this post, I don’t know where to start!! The gorgeous gift tags are fantastic! And again with the class prize!! What a great idea! So fun! I love photo play paper too! Love, love, LOVE these tags! And the prizes! Holy schnitzels! Thanks for all the wonderful things up for grabs! The tags are so wintery, I love that! Gorgeous tags! Love the giveaways again today! Thank you! I love your tags today! Great prizes as well. I would love to give my friend the SCT online class. She is currently in a crafty funk and I think it would really inspire her! Oooh those tags are so pretty! Pretty tags today…so classic in the gray and white. Happy holidays! Beautiful tags, will try to do some for my house. Great gives today and thanks for the opportunity. Love the paper packs and the $50 gift certificate ain’t too shabby either! Love all these prizes & the tags are a great idea. Wonderful tags. Thank you for insipiring us, every day, to boost our creativity! Thank you, also for the fabulous giveaways! Thanks for offering all the great new products for the SB&CT giveaway. Would love to win & try out all the new ideas, especially the vintage girl papers! The tags are so pretty – love the color combo. Thanks for all the terrific prizes!! Thanks for offering all the great new products for the S&C giveaway. Would love to win a prize & try out all the new ideas, especially the vintage girl papers! Love the bright colors in these paper packs! Love the idea of an online class to inspire for a whole year! A gift certificate and new to me paper lines, what more could you want? Those tags are great. So simple but elegant. I love the paper packs giveaway and the class for two is awesome! Great give aways once again. Such great tag ideas. Such great companies represented today. Thanks for the chance to win! The tags are very nice and the giveaway is great. I would love to have those papers to create with. Thanks for a chance to win. What am exciting prize! Pick me please…..
What gorgeous tags! I love the clean, simple look. Thank you for another great giveaway. Cathy outdid herself. Beautiful tags! As to the prizes: amazing! The collections are just what a srapbooker needs.A gift certificate to a most wonderful class! And $50 to spend, oh, my! Three amazing prizes – thank you so much SCT. I’m absolutely in love with the tags! So pretty! These prizes are making me drool! 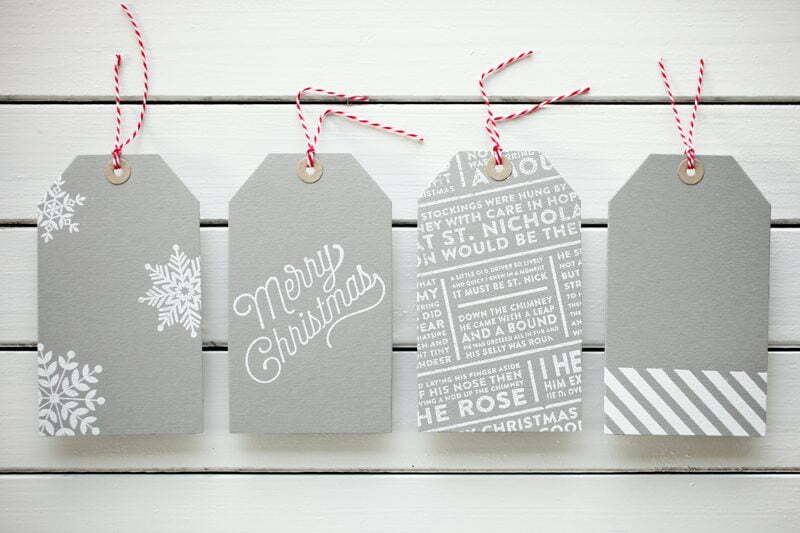 love the simplicity of the Christmas tags! Beautiful Tags! Thank you for the opportunity to win such an amazing prize! Oh my goodness I LOVE Cathy’s Tags! The grey and white theme looks a,a ing. Oops not done…thanks for the chance to win the Shery Arts kit and the YNS gift certificate. Another great day. Your lovely tags are inspiring me to get crafting some! Thx for that and thx for the great giveaways! I love the clean, crisp and fresh look of Cathy’s tags! And you can never go wrong with Doodlebug twine. I always smile when I see YNS featured. It makes me so happy to see a Canadian stamp company doing so well. I love their awesome stamps and dies! Photo Play Paper’s collections are beautiful. The colors and prints are magnificent! 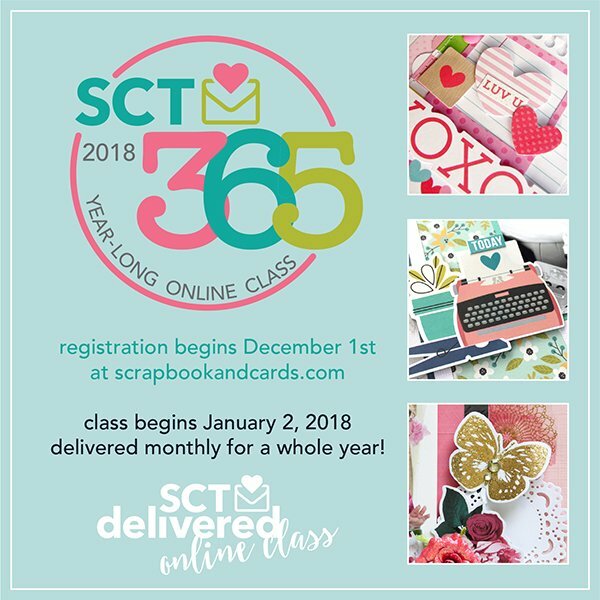 A spot in the 2018 SCT365 online card classes would be just the best way to start off the new year! Thank you so very much SCT, YNS and Photo Play Paper for a chance to win these awesome prizes! Gorgeous tags – really like the grey/white combo! Love the tags. More great prizes. I love Photoplay. Stunning tags. I’m obsessed with gray these days so these tags are perfect! Nice tags. Thank you everyone. Perfect inspiration for me today! My dear daughter is in need of Christmas tags and because of severe health issues that just came on with her littles she is super behind for Christmas. Mama to the rescue. These tags are delightful!! Please correct previous post. I made a typo. I meant to say I would luv to play with this beautiful paper. Amazing prizes, thanks for the great giveaway! Tags are so easy and fun! Love the tags. The embossing really makes it stand out. Thanks SCT. Cute idea for making quick tags! I love making home made tags each year. These prizes are all so fun! Thanks for the chance to win!! Really love that you are including prizes for a friend also in this give-away. Thank you for being generous – and for helping all of us to be generous as well! WOW, totally amazing. I’m a big fan of making my own tags. The SCT online class would be a super prize (and for a friend!) – very generous. Great tag ideas going to steal them. Waiting for the Wizarding World paper pack from Photo Play. The tags are very classy. Love these giveaways. Great way to try new products or rediscover old favorites. Fabulous tags! The smoke cardstock is such a great choice! Thanks to you and the sponsors for more great prizes! Wow, Id love to win the great giveaways & use the products to scrapbook! Thanks for the chance to win! What sweet tags! Sometimes it is good to be reminded to do simple, lovely things. What a nice prize pack too! These tags have my name and style written all over them. I want a set! I am registered for the class and excited to get started again this year. Merry Christmas! Love the tags and what a great prize collection! Love the clean lines of the gray tags! Also, THOSE PRIZES, wow…tons of great stuff! Thanks for the chance at winning. The prize packages keep getting better and better! What gorgeous tags. Thanks for the chance to win more great prizes. Elegant tags that would be perfect to mass produce. A treat bag full of these would be a great gift. Those tags are awesome !!! Embossed background .. yes please ! Wow, love this technique. Will have to try this! Great idea for the tags and they look amazing! Learned about two suppliers today that I’m not familiar with – thank you Photo Play Paper and Your Next Stamp – you have awesome stuff to offer! I’ve never heard of these companies before so I’d love a chance to play with some new to me companies! What a prize packed giveaway this day is – Wow! Would love the class & being able to bring a friend to the fun – thanks SCT!! ? Such a great prize package today. Love the Photoplay collections. Thanks for the chance to win. The grey and white tags are so fun! Thanks for all the great prizes today! Wow ?..what a giveaway. Photoplay paper products are always amongst my favorite. That memory lane collection is stunning and i would be so lucky if I could win it . The online classes is also great . Thanks for the chance and happy new year everyone. I really, really love those tags! Gorgeous! And fabulous giveaway today! Thank you so much for the chance to win! Love the tags, Great giveaway! Lovely tags — that grey and white combo is great! Excellent prizes, too! Wow! Anyone would be all set with this prize! Stamps, paper & beautiful inspiration! as always, love the papers … and the techniques I will surely put to use. Thanks so much. Love that Memory Lane line. This is another fabulous pak to win! Love the snowflake tags, so simply beautiful. Beautiful tags and it gave me ideas for this year’s Christmas gifts tags. The prizes are great and I didn’t know about “Your next Stamps”. I love making my own gift tags and these are perfect. Thanks for the inspiration! much for the chance to win these great giveaways! Okay, those tags are so adorable, so easy and so quick. Many thanks to the vendors for the awesome prizes! Love love these elegant simple tags!!! Beautiful tags love them. Thanks for the chance to win. Great tip on the tags (using an anti-static bag….I always forget)! Thanks for the opportunity to win from the great sponsors…and SCT 365 for me and a friend – what a prize! These tags are beautiful, I can’t wait till birthdays and next Christmas to create my own!!! I usually just use the stick on kind from dollar store, but these are so fun! Maybe I’ll make some at Crop and Create! Wowee!!!! What great prizes! So much fun! Cute tags! I love the font on those stamps! Thanks for the inspiration and for the opportunity to win! This prize would be a dream come true! Pretty papers and stamps, and inspirational ideas! What great prizes. Love all the papers. Thanks for the chance to win. Nice one! Lots of color and the die set could be used all year! LOVE the white embossing on the grey tags! Super cute! Great prizes, love Your Next Stamp, thanks for the chance to win! What a great idea… homemade gift tags… love it. Thanks for the great giveaways. Oh my goodness – what wonderful prizes. I love the papers! I love making my own tags and adding a fun object instead of a bow. Most of my parcels have to be posted away and bows just get crushed in posting. Love these wonderful tags! Super cute – I’m always looking for new ideas for gift tags. Wonderful prizes! So generous. Thanks for a chance to win. Those are such nice paper kits! Such beautiful tags! Thanks for the chance to win these great prizes! Great prizes. Thank you for the opportunity to win. Wow, great prizes! Nice and simple tags, I like how they coordinate but are still each very different. What a great color combination! Love the prizes! These tags are beautiful. What a great idea! I have the stamps and will have to scrap-lift. Thanks for great ideas and beautiful projects. Your Next Stamp looks like an awesome company. I’d love to be able to purchase some of their stamp sets. Photo Play is completely new to me. Their products look really nice. I’m definitely interested! Oh that 365 class…! Thank you to the sponsors! Such stunning And classic tags. Love the grey card stock. Love those tags. Thanks for a chance to win. Great tags. Thanks for the chance to win. These tags are so very nice and simple. beautiful tags .. thanks for the giveaways, I just discovered your next stamp and would love to win! More great tags. I would love to win this prize especially the class for inspiration all year long. Another great give away !! Thanks for the chance to win !! These tags are so classic and beautiful. Thanks for sharing your creativity with us and thanks to SCT and all contributors for the great give aways. Todays prizes are amazing. Love the vintage girl line, since I am vintage too. Simply elegant tags, I love the color combination! Thank you to the wonderful sponsors and the chance to win this great prize package…Happy Holidays! Beautiful tags! Thanks to Your Next Stamp and Photo Play Paper for the prizes! Such great sponsors to your magazine and 12 Days of Holding Giving contest. Wonderful collections. A triple giveaway. Soooo generous. Love the vintage papers. These are my kind of tags! Modern, elegant, graphic – wow. And the prizes… each day is so fabulous, your sponsors are amazingly generous. Thank you. Love those clean and crisp tags! And, love these prizes from Your Next Stamp and Photo Play Paper AND the chance to win SCT 12. Yay! Thanks for fabulous prizes and ideas! Love those clean and crisp tags! And, love these prizes from Your Next Stamp and Photo Play Paper AND the chance to win SCT 12. Yay! Thanks for such great prizes and ideas! Cathy’s classic simple style always makes me swoon. These tags are gorgeous!!! And more amazing prizes! Those tags are so clean and simple and STUNNING! Thanks for the chance to win! Cathy did amazing work on those tags! I love them! Thank you so much for the inspiration! And thank you for the wonderful giveaways! Grey and white … love those tags! Thanks again for the chance to win. Love the tag ideas, thanks for more ideas Thanks for a chance to win. I really love those clean and simple tags! Thanks Cathy! And the prizes are wonderful too. Thanks SCT! These tags are just what I like and would look great on so many packages! Thanks for the inspiration! I like the simplicity of doing all the tags in a theme. Great color choice too, as gray would not be “go to “ color in the holiday season. Thanks for sharing. Fab tags, and thanks for the introduction to Your Next Stamp, I had not run across them yet. Gorgeous and elegant tags. I love the idea of coordinating the look of your tags. Love the simplicity of the tags. Thank you for a chance to win, Good luck to all. Love the idea of reinforcement circles with the Infinity dies from Hero Arts! Great prizes from all sponsors! Love , love, love, thank you for the chance to win! My resolution for 2018 is to create my ‘autobiography’ for my children. These paper packs would be AWESOME to use! Oh wow! These tags are beautiful. The grey and white is so striking. I would love a chance to win! Thanks!!!! Very elegant tags. Beautiful paper packs too. Such lovely prizes. Pretty tags! Love the Sharpie paint pen. I always love making tags throughout the year. These are so lovely. Awesome giveaway. Id love the yearlong classes. Thanks to all the sponsors. Merry Christmas. I really love the tags and the tag die set looks really cool! Thank you for the chance to win and to all the great sponsors this year! I love the tags and all the beautiful prizes. Thanks for the chance to win such great goodies! 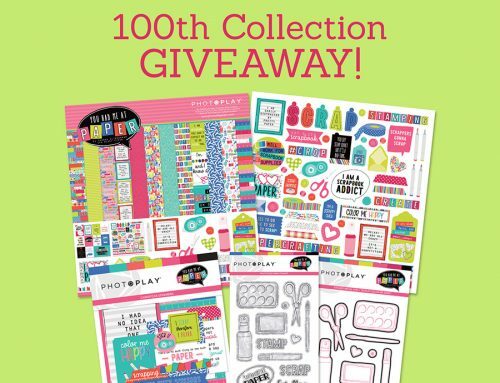 Thank you to Your next stamp, Photo Play Paper and SCT an amazing giveaway!! Thank you for a chance to win!! I love the simplicity and elegance of these tags… thanks for creating them and thanks for the chance to win! Such elegant tags! <3 them! Thank you, again, for a chance to win! Another huge fan of Photoplay here!!! What a wonderful prize package – thank you for the opportunity to win! Those tags are so elegant, love them! CUTE TAGS! Also looooovvvee the idea of having a $50 gift certificate. Love this prize! The papers are gorgeous and the tags are awesome! Thanks for the opportunity to win this lovely prize package! these are so pretty…even without glitter, even though I’d probably dump some on anyway. These are classy like this! Gray and white are so elegant together! I LOVE YNS adorable stamps! And those papers from Photo Play Paper are LOVELY!! My friends Janis and I would totally love to win your 2018 classes!! Another wonderful day of prizes!! How wonderful would it be to find some of these products under our tree?!?! Santa, “Tag” me for these great Hero Arts gifts! The tags are gorgeous! I like to make my own gift tags too! Great tags and great prize! Oh, I just love the paper designs; you all just make the most adorable scrapbooking paper! <3 I'm in love! I love the simple gray, white and red theme for these tags. Crafting made easy and fun. Thanks for the great prizes!. Such wonderful gorgeous tags! Amazing! I have a page on Pinterest called Tag Bag because I LOVE tags. These are pin worthy for sure! Thank you for the opportunity to win, for the inspiration and for the fun! Merry Christmas and God Bless! How much fun would it be to get to spend 50.00 at Your Next Stamp! I like to use my scraps and make handmade tags too! Lovely ideas. I love the gray/white and so simple and classic.Great ideas. And wonderful prizes too. Would love to do some shopping for myself after the holidays. Thank you. Happy Holidays! Shows that you don’t have to use red and green for Christmas tags or cards. What an amazing giveaway from the sponsors. Thank you. Those tag dies would make my life a whole lot easier when gifting others! I love the tags because they are simple and in an unexpected color! Love the tags – so simple and elegant! Thank you to YNS and Photoplay for the chance to win some awesome prizes! More great tag inspirations and prizes. Great prizes but the one I am most excited about in the SCT 365 spots for me and a friend….how awesome would that be!! Another great prize I would love to win! Love love this prize package…..thank you for the chance to win! Another day with awesome sponsors and terrific prizes! Thank you YNS, Photoplay and SCT for the chance to win these awesome prizes. Prizes from three great companies what a bonus. Classes, paper and the chance to pick out any stamps my heart desires. Thank you so much for donating such wonderful prizes. Love the tag die cuts! Wahoo…spots in the new class!!! Great tags, the Die is is awesome! Oooh, classes would be wonderful!! Thanks to the great sponsors! Would love the opportunity to create with these great products. I’ve already signed up for the class — alumni of 2017 class. Thanks to Your Next Stamp, Photo Play, and SCT for this give-away. Love the Die Set and tag ideas. Thanks to the great sponsors. Simply beautiful tags. Love those paper pads too! Cute tags! Thanks for the chance to win! The photoplay papers are amazing. I have never used photoplay papers – I am going to have to get some. Thank you for such a great prize. Love these tags! 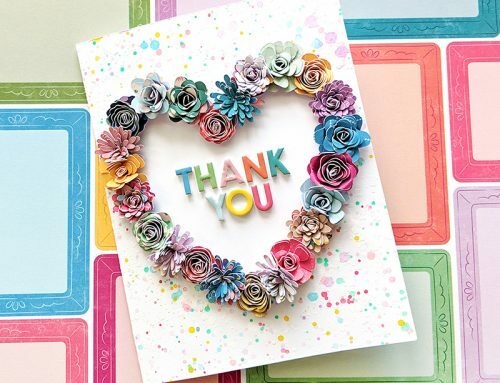 Between the die cuts and paper……heaven! Thanks to SCT and all the sponsors! I love your elegant tags Cathy! Thanks for the chance to win! Beautiful tags Cathy! Thanks for sharing! Thanks SCT for another day of very generous sponsors! gorgeous tags. simplicity is beautiful. the 365 day class sounds so fantastic and to be able to do it with a friend would be so fun and motivating. thanks for the opportunity to win! Tags are really cute and easy thanks for the chance to win! Love the options tag dies give us.. so versatile! Beautiful set of tags, so classy! Okay. If I’ve ever become the ‘queen’ of anything, it would be the Queen of Grey! Cathy, you’ve ticked every grey-loving box with your darling tags… SSS Smoke is a beauty! and simple white heat embossing is all that is needed to complete the task at hand! YAY for GREY!!! … and all of the generosity of your wonderful sponsors today! What better way to get to know new-to-me companies than to be able to ‘play’ with their products! Love the monochromatic look on these tags! Gorgeous papers! Thanks for the tag ideas! Simple and sweet tags! Awesome prizes! Merry Christmas! How on earth have I not heard of PHOTOPLAY??? WOW! Gorgeous collections!! I will HAVE to check them out! Thanks for great giveaways today! Oh my word. So much goodness. Love the tags and cohesiveness tips, and the prizes (er, gifts) are wonderful. Your Next Stamp offers great stamps – and Photoplay paper designs are unique! What a great combo – thanks for an exciting bundle! Merry holiday to all! Just love all the tag ideas here and the use of paper is wonderful. What a super bundle of items for a giveaway. Loving these tags! I haven’t gotten out the embossing powder in quite some time, just might have to…but gonna need that cardstock! A very modern palette for tags, love it! Love the tags – maybe that will be my project for next year….will get them done before the cards! Would love to win the SCT 365 Online class. I took part in the first year and would love to join in for year 2. If I don’t win, I will definitely be enrolling after Christmas. Tailored Expressions is a fun company so shopping would be easy and Photo Play paper – awesome! Thanks for the prizes and Merry Christmas! Simple and beautiful! Thanks for the chance to win! Wow! Thanks for the great gift ? These CAS tags are lovely ! Thank you for offering up these great prizes. I love photoplay. I am drawn to more and more of their collections everytime they come out. Definitely joining, thanks for the chance to win! I love this package too. I love the Your Next Stamp lineup and the Vintage Girl paper also. More tag possibilities are amazing. Love the paper in this package. What great tag ideas!! What a fun week – thank you to you and the sponsors! I love making gift tags too and Cathy’s are beautiful! I love the gift tags. I really should make my own next year. Thanks to the amazing sponsors! The gray and white is a great combination to use with the green and red of Christmas! Your tags are beautiful Cathy! Making some tonight! Thank you Photo Play Paper and Your Next Stamp for great giveaways, and SCT for making this happen. Merry Christmas! What a fun class idea–and awesome prizes! Thank you for sharing your Christmas Spirit with your fellow crafters!!! These tags are so pretty and easy to make. Awesome prize package – thanks for the opportunity to win. More Beautiful tags. The perfect way to personalize gifts 🙂 Well done. The giving today is amazing! Your next stamp (one of my favorites), SCT’s classes (always good), PhotoPlay Paper (amazing). Thank you to all of the great sponsors for putting gifts under our tree. Love the simple yet elegant look of today’s tags. Thanks for another chance to win some wonderful prizes today. Thanks for some more great ideas and of course this wonderful contest. 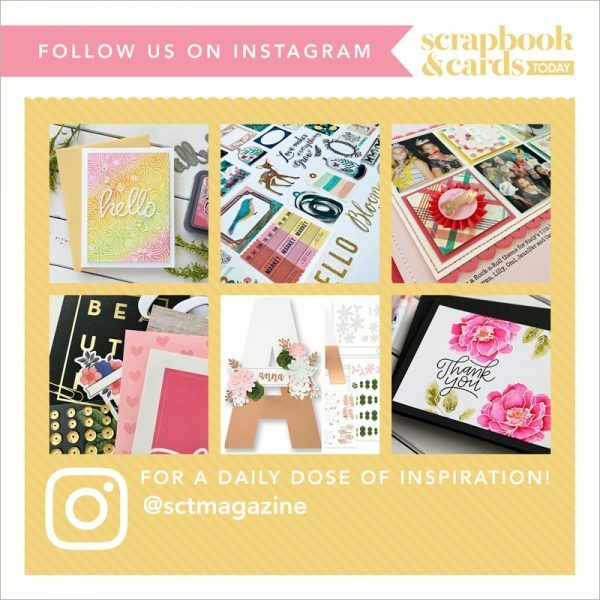 And wouldn’t it be wonderful to win the SCT 365 — particularly since my New Year’s resolution is to make 1 .. just one … scrapbook page every month in 2018!!! OMG, to win a spot for the class along with a friend, WOW. Thank you for this chance! Cathy Zielske tags are classic and simple, just beautiful! On the eighth day of Christmas SCT has for me, fifty dollars to buy my next samp Yippeee!!! Beautiful tags and gifts from some of my favorite companies! What more could a girl ask for? Thanks so much for the chance to win these fabulous prizes! Wow to the tags and to the prizes! I took the 365 class this year but I must confess, I am quite behind on my layouts. However, it is a great class and it keeps, sort of like fruitcake (LOL)! Great tags! Nice choice of colors. Simple but really nice. Today’s sponsors are all among my faves! Thanks for the chance to win! Wow amazing prizes! Love them all. The tags are so gorgeous! Very sophisticated look. Just so much fun! Would be so excited to win this! I would love to receive a gift with a tag like these attached to it. Beautiful work! Great giveaways from the sponsors. Thanks SCT. Such lovely pretty bundles! Love them! I love the classic look of these tags. Thanks for the giveaway. Lovely papers! And the tags are beautiful. Thanks for the opportunity to enter. This is my favorite time of year to make cards and gift tags. Thanks for the ideas and the giveaway! Start the car! Or better yet, I’ll walk. Your Next Stamp is in my neighbourhood. I’d have so much fun shopping with a $50 gift card. The Photo Play papers are sooo pretty! And another chance at an SCT class; it doesn’t get much better than that! 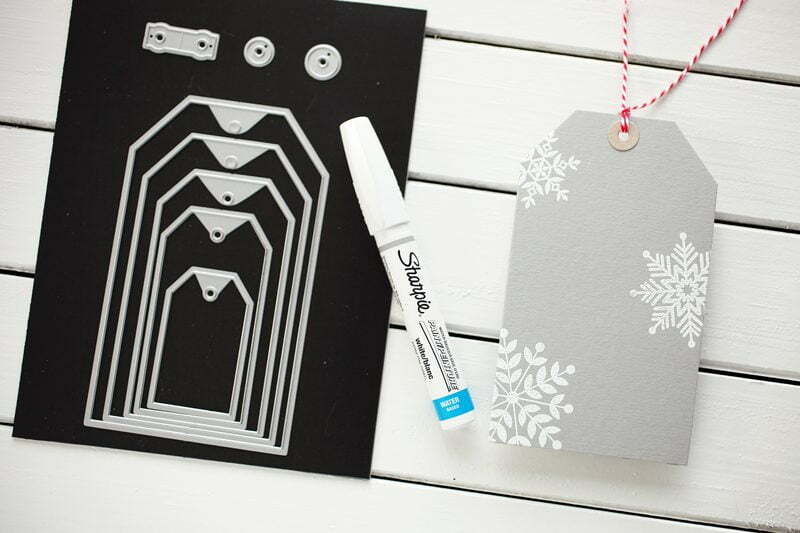 Oh my gosh – LOVE the color of the gray tags and also the idea of using the Sharpie white paint pen!!! Love Your Next Stamp and Photo Play! They are so creative and very generous to donate such wonderful prizes! I took the SCT365 class last year and highly recommend signing up if you don’t win it. It’s really worth it. Thanks, SCT! Adorable tags! Thanks for the chance to win! Happy holidays to all my friends at SCT! Love the great project ideas! Love your publication! Thank you for the chance to win some fabulous prizes! Happy holidays! Thank you Your Next Stamp and Photo Play Paper and SCT for today’s prizes and the opportunity to win!! Such lovely tags and thanks to Your Next Stamp, Photo Play Paper ans SCT for the wonderful prize package! Loving the new bite on grey with pop of red combo!!! Now I want to go make tags! Great prizes!!! Thanks for the chance! I’ve heard nothing but good things about Your Next Stamp. Wow, those are lovely. I thought they were stamped and heat embossed. Thanks for the chance. super cute tags! i love to make tags, too, but rarely have my act together enough for them to coordinate with the wrapping paper I have! what a fantastic day of prizes!! The prizes today are fantastic. If I win the SCT365 Year Long Online Class I would share this with my scrapbook buddy Deb. That white embossing on the tags looks great on the gray. That Sampler is a great idea and sounds like lot’s of fun in a box. All the prizes that have been coming daily, are really wonderful. Thanks you! Beautiful tags! Love the white embossing. Love the prizes. Could find many ways to use them in my craftroom. Thanks. Those tags are so beautiful. I have some gifts that they would look amazing on. Can you express mail them to me????? Thanks for the chances to win! Merry Christmas to everyone!!!! Wow, I love everything in today’s giveaway. Thank you for coordinating this and giving us the opportunity to win! That 365 class is a great prize!! Inspiration all year round! What an amazing giveaway!! I would be so happy to win any of the 12 days of giveaways!!! Thank you and all the sponsors for what you do to keep us motivated to create!! !